Wanda the Scarlet Witch Commission. Size: 7" x 10.5", 1998 Signed art by George Perez. PLEASE SEE MY ABOUT ME PAGE FOR 1000'S OF PICTURED ART PAGES AVAILABLE. See ABOUT ME for 1000's of original art pages in stock. The artwork pictured are all one of kind originals unless otherwise described. 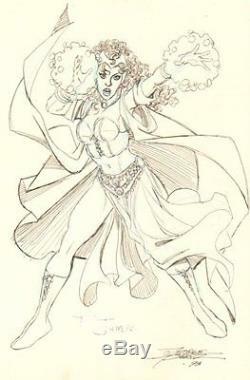 The item "Wanda the Scarlet Witch Commission 1998 Signed art by George Perez" is in sale since Thursday, February 27, 2014. This item is in the category "Collectibles\Comics\Original Comic Art\Other Original Comic Art".